Pollution isn’t just Earth’s problem anymore. Despite not having established a permanent lunar residency, humans have already managed to dump 400,000 pounds of trash on the Moon. Much of this debris has been left behind over the trips by humans to the lunar surface. Earthbound scientists figured out long ago that bringing the lunar visitors home would be cheaper and simpler if as much equipment as possible were left behind. Add in debris accumulated over unmanned missions, and we have something of a lunar junkyard orbiting overhead. It’s important to remember that the trash we have left behind on the Moon does not exist in a vacuum. There is an enormous amount of space waste floating around our planet. Over 21,000 pieces of trash, from spacecraft fragments to disabled satellites, orbit the Earth. Most of the Moon’s trash was the result of crashed spacecraft, of which there are over 70. The remainder of the debris is a mish-mash oddly documenting humanity’s short lunar tenure. Because it is easier to return to Earth with as little weight as possible, each moon landing has permanently dropped a 22,700-pound Lunar Lander on the surface, as well as other modules, craft, or miscellaneous materials associated with that particular mission. Waste from low-gravity golf games as well as literal human waste (all 96 bags of it) litter the Moon’s face. To be fair, we haven’t left only waste. A small aluminum memorial left by the crew of Apollo 15 to honor fallen astronauts stands on the silent lunar landscape. The feather dropped in Apollo 15’s “hammer-feather drop” experiment also remains. Even though the Apollo 1 mission never made it to the Moon, as it was shut down prematurely after three astronauts were killed during a training exercise, a patch from the unlaunched mission found its way to the lunar surface too. 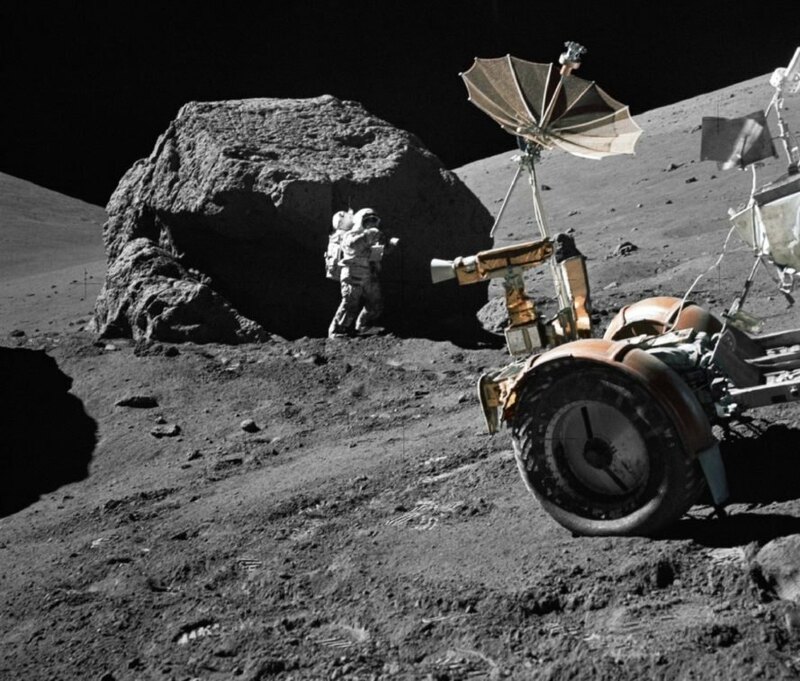 A Lunar Rover is one of several vehicles ultimately abandoned on the Moon's surface. An astronaut leaves footprints on the Moon's surface as he walks away from a sizable lunar boulder.